GO Outdoors founder John Graham recounts a day in Snowdonia with the Mail on Sunday health editor, Barney Calman, climbing some routes that he hadn’t tackled in years. I enjoyed a fabulous day in Snowdonia last week visiting some of the old haunts of my well spent youth. It was a climbing trip that was full of old memories and allowed me to make some fresh ones with a new friend of mine, Barney Calman, the health editor of the Mail on Sunday. I also managed to do something for the very first time – I stayed in a youth hostel! The only time I’ve ever tried before was when I was 16 and I’d walked the 25 miles from Harlech to Pen-y-Pass wearing only a duffle coat and wellies. It was 11pm by the time I arrived and the night was filthy… snow, wind, the lot. I called at the YHA and asked if I could sleep on the floor to get out of the weather, but I was refused because I didn’t have a membership card, nor the £8 needed to join. Thankfully, I had a friend who ran a cafe in Llanberis called Pete, so I trudged another five miles and got him out of bed and, bless him, he let me sleep on the floor. This time the manager at the Pen-y-Pass hostel where we stayed said they’d have let me in, as it is now YHA policy never to send someone away in a snowstorm. Anyway, I’m pleased to report that the hostel was lovely, newly refurbished with very good food. Crucially, the bunks were very comfortable. More comfortable, I admit, than the bivvies we used to use – we were the original wild campers! Barney and I had a plan to go and do Main Wall on Cyrn Las, which is a six pitch, hard severe, so it’s a brilliant climb, which I last did 30 years ago. The problem was that the weather had come in and it was very wet and would have made Main Wall very slippy indeed. 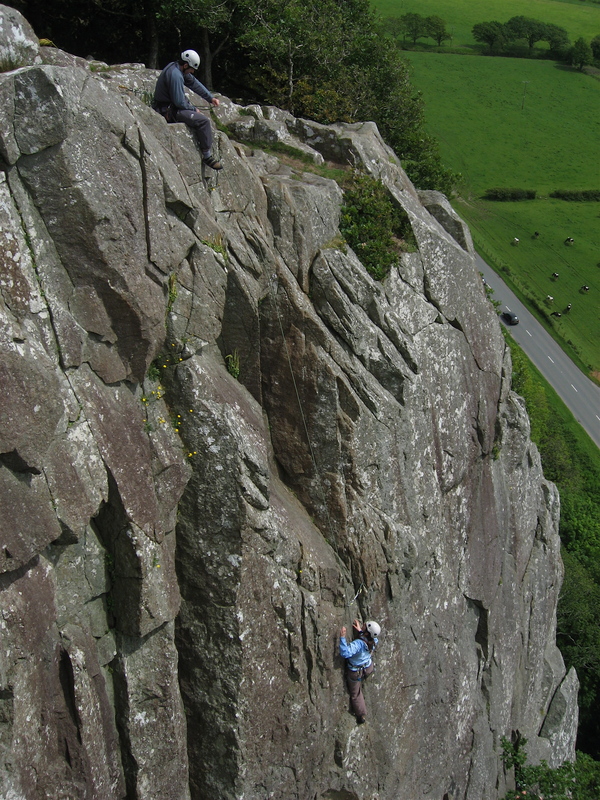 As a result, we decided to go down to the coast to Tremadog, where there are some fantastic cliffs that dry quickly. We started with Christmas Curry , a three pitch, severe. Now the last time I did that climb was when I was 18 and without a rope. I was recovering from being badly beaten up and I had a blackout on the final pitch. Thankfully, I’d managed to wedge myself in a little scoop and the friction of my body was just enough to keep me from falling off. It was quite a shock and I was advised by a doctor to stop climbing. It took three years before I was finally prescribed some medication that stopped the monthly blackout cycles I was having and allowed me to start climbing once again. Barney and I were climbing as a team. I have more experience, but he’s actually a really smooth climber and great technically. I was showing him the administration side, so ropework and belaying, the skills that make you an efficient climber and are very important, particularly in the mountains. Christmas Curry was a really nice start to the day, even though it was a bit greasy and blowy, and we then went and had a cup of coffee at Eric Jones’s cafe at Tremadog. Eric is an old friend of mine and was a bit of a mentor to me when I was younger. He is still basejumping today even though he is 79. Outrageous! Eric was the first British climber to solo the North Face of the Eiger and it was great to see him again. We chatted about a recent trip I made to Yosemite and Eric had his own story to tell – a bear tried to get into his tent, so he decided to sleep in a cabin the following night… Eric is tough, really tough, but not so tough as to take on a bear! Barney and I then went and did Yogi. Now the first pitch is really dangerous. It’s unprotected and Barney did a cool lead, climbing it really nicely. 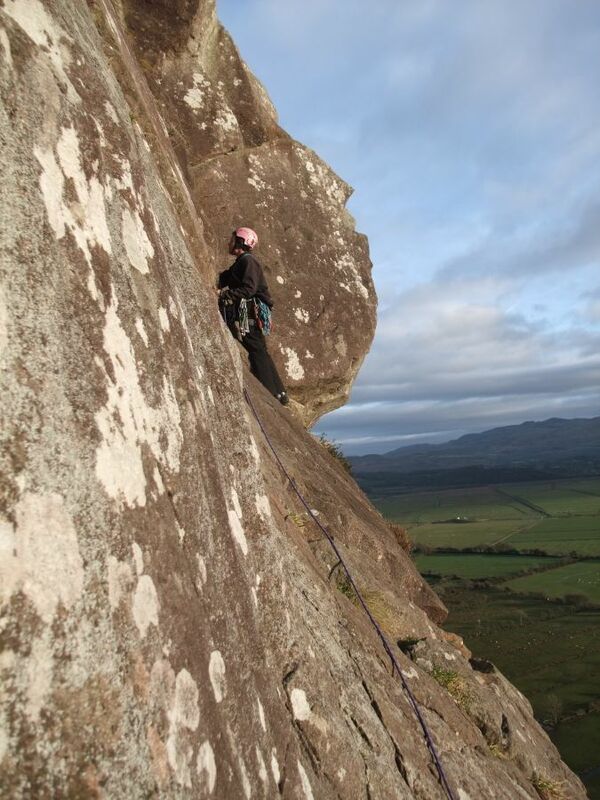 I led the second pitch, which was well protected, delicate and a joy to climb. By then the rain had stopped for an hour, so everything had dried off and we decided to take on Poor Man’s Peuterey, which refers to a very famous ridge climb on Mont Blanc. The climb should be four pitches, but I turned it into three, leading a long first pitch to set up Barney to lead the crucial second pitch. We were about a hundred feet up and positioned so that Barney had to climb sideways. The crux of the climb is the exposed traverse out on to the nose. It’s not technically too difficult, but it’s wild and intimidating and, just as Barney started, the wind picked up and was really tugging at him. There were gusts of about 40mph and it made the whole experience much more nerve wracking. The wind meant we lost time and, once Barney had made himself secure at the belay, we had to move fast as we were losing the light. This meant I climbed very quickly past a spot of great significance to me. This was where a friend of mine slipped soloing years ago and died. Until now I’ve deliberately avoided this climb as a mark of respect, but it felt right to do it with Barney, particularly on a day when we were focusing on the safety aspects of climbing. Still, it brought back some keen memories… always remember that the biggest danger is your own complacency. When it comes to ropework, you must practice, practice, practice. When it comes to safety, you must check, check and check again! This entry was posted in Climbing, Staff Stories and tagged christmas curry, climbing, pen-y-pass, poor mans peuterey, snowdonia, wales, yogi. Bookmark the permalink.